Both tension and emotion require an identical pairing of traits in order to be successful; narrative and aesthetic. Of course, everything on TV has both a narrative and an aesthetic, but to push tension and emotion to their peaks, these elements both need to be working extremely well and cooperating with each other. An emotional scene could not work without fitting visual design and an intricate story preceding it, much like tension would fail should the aesthetic be poor and the plot uninteresting. Across its entire run, my ultimate favourite thing about Hannibal has been its ability to combine narrative and aesthetic so seamlessly and in such an innovative, refreshing way. Hannibal could have been a simple slasher series, episode after episode of violent murders and gallons of fake blood, but Bryan Fuller and co turned it into so much more. Sure, this is almost unquestionably one of the most gruesome shows ever aired on network television, but Hannibal uses both its narrative and its aesthetic to transcend its seemingly basic genre. Hannibal never gave in to simplicity, it never gave in to expectation nor convention. All the way through to its final episode, its perfect wonderful horrifying final episode, Hannibal has excelled in every way good television should. It's hard to imagine we will ever be treated to another show quite like it. In fact there's so much to talk about with this finale I'm not entirely sure where to begin. The Red Dragon arc may have only spanned six episodes, but its story feels completed. Hannibal took a big risk jumping into this arc for its final stretch of episodes, but what would Hannibal be if it didn't take risks? I had no doubts heading into the closing six episodes that they would be as beautifully horrific as everything else this show had undertaken, and they were. Armitage was a strange casting decision, but one that paid off entirely. He fully understood Dolarhyde's state of mind, allowing us to see so clearly into him but without allowing us to fully understand how he works. If we did know entirely how Dolarhyde's mind worked, his character would not be as frightening as it was. His faking of his own death in this episode's opening was fantastically intense, coupled with Reba's desperate escape from his home. This show has been so unpredictable for so long now, I wouldn't have put it past Fuller to actually kill Dolarhyde in the opening of this episode. But then, that would be robbing the show of its perfect final sequence. Everything that took place on that cliff side in the episode's close was exquisite television, and a perfect encapsulation of everything Hannibal is about. Despite its fully fleshed out supporting characters and its case-of-the-week murders and its truly wonderful visual & sound design, Hannibal has always been an epic love story between two men, and one with its ending never in sight. Due to its consistently low ratings, every season finale of this show had to simultaneously act as a show finale in case the series failed to be renewed, but The Wrath of the Lamb was the first episode to truly feel like an ending. That's not to say the previous two season finales were inadequate television, both Savoureux and Mizumono are stellar episodes in stellar seasons of a stellar show, but this finale achieved the seemingly impossible; it made Hannibal's departure from television seem OK. When Savoureux ended, I was desperate to see how Will and Hannibal's dynamic would develop. When Mizumono ended, I needed to know who made it out of that bloodbath and why Bedelia was travelling with Hannibal. When The Wrath of the Lamb ended, I was content. Well, as content as one can be when one's favourite show ends so beautifully. Hannibal and Will finally did something the show has been building to for a long time now; they killed together. In a way, their slaying of the Red Dragon acts as their declarations of their love for each other. Will accepted in last week's episode that Hannibal was in love with him, but his counter response was left ambiguous. Following their brilliantly dramatic murder of Dolarhyde, Will embraced Hannibal on the cliff side. Was this Will saying he understands and accepts Hannibal for who he is? Is Will declaring his love for Hannibal in the only way Hannibal would have wanted him to? It's a surprisingly emotional moment in a delicate way that this show rarely takes pleasure in, and I found myself puzzled by how quickly it all had happened and how simple it seemed to be. And then Will, in Hannibal's arms, pulled them off the cliff side, together. It's a moment that was foreshadowed heavily in the episode; Will told Bedelia he intended to actually escape with Hannibal rather than fake his freedom, but he also agreed with Jack's plan to murder both Hannibal and Dolarhyde. How can one both murder someone and escape with them? They must die together. It's a perfect summary of the story this show has told since its first season; Hannibal and Will was a love story, albeit a doomed one. They could never both make it through this alive, and they both understood this. 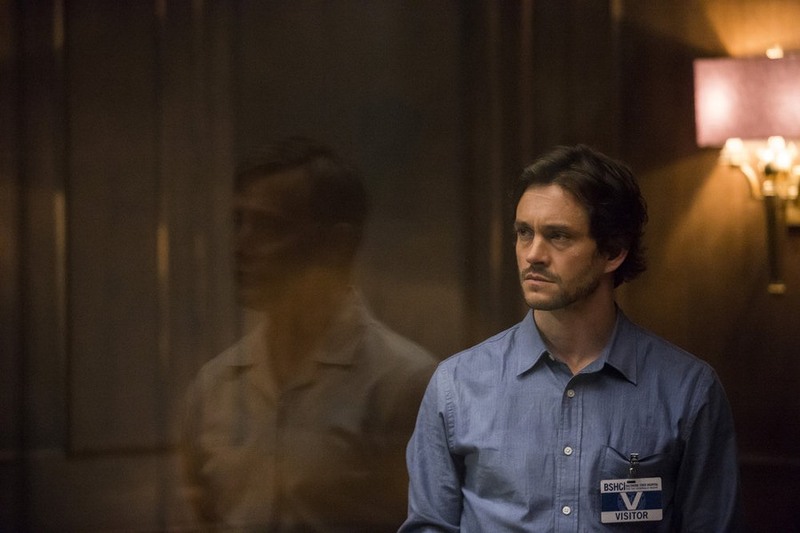 Will forgave Hannibal for what he did in the season two finale, but he never let it go. The only way for their stories to end together would be for their lives to end with it, simultaneously. But just as all seems finalised and closed, Hannibal returns for a brief post-credits sequence, in which Bedelia du Maurier is sat at her dinner table with her own amputated leg as the main course. And there are two other places set. Did Hannibal and Will survive the fall? Is Bedelia cannibalising herself for herself, with the other table places acting as a symbolic gesture as to who dragged her to this moment? It's unlikely we will ever know for sure, and I have no desire to. Hannibal told the story of Will Graham and Hannibal Lecter, and their story ended on the cliff side. I feel I can say with confidence that Hannibal was the most aesthetically and narratively artistic show on television. Whilst some palm the show's style off as "pretentious" or, with negative connotations, "arty", they fail to appreciate how this show uses its aesthetic to benefit its narrative, and vice versa. Hannibal is not realistic TV, but it never tries to be. Realism is not the goal of this show and that does not matter one bit. Hannibal is about its characters, it is about its interesting story arcs and its stunning cinematography and its wacky yet brilliant sound design. No show currently on TV has been as wildly experimental as Hannibal, and yet none of Hannibal's experiments ever failed. Bryan Fuller has proven here that risk taking is important for successful TV; after all, who wants to watch a show where they can predict every eventuality? Since its offset, Hannibal has subverted expectations, and it's what has made this show so critically acclaimed yet so rarely watched. It's a real shame that Fuller won't get to complete his seven season vision for this show, but The Wrath of the Lamb is a perfect finale to a pretty damn perfect season of an even more perfect show. But now we have to bid farewell to one of the most audacious, powerful and beautifully horrifying productions television has ever seen. It's been one hell of a ride, but it's time to get down from the table. I didn't even have time to discuss Jack or Alana or Chilton so I'll run through them quickly now. Jack's real ending came when he took Hannibal into custody, so his lack of screen time here is acceptable. Alana and Margot left hand in hand with their son and I couldn't be happier. And I don't imagine Chilton is going anywhere any time soon. "You died in my kitchen, Alana, when you chose to be brave. Every moment since is borrowed. Your wife, your child, they belong to me. You made a bargain for Will's life, and I spun you gold". Hannibal was allowed to be scary in his cell in this episode, rather than amusing or darkly comic. And I loved it. "You righteous, reckless, twitchy little man. You might as well cut all of our throats and be done with it." I will miss Bedelia du Maurier a lot. Gillian Anderson has been excellent this year. I also love how the season started and ended the same way; Hannibal is free, but Bedelia is still under his manipulation. I've really enjoyed this season's use of mirrors and reflections to discuss its characters. Look, for example, at the picture leading this review. Hannibal's cinematography is one of the things I will miss the most. I know I said I was content with this finale, but don't read that as an "I don't want the show to come back" statement. If this show ever does come back, I will be over the moon. The camera pausing, then slowly tracking towards the cliff side and peering down into the crashing waves rivals the aerial shot of Walter White as the greatest final shot of a TV show ever. Goodbye, Hannibal. One final ode to Bryan Fuller: Thank you for creating my favourite television series of all time, I can't wait to revisit it time and time again and understand more of your wonderful vision every time I do. I've loved every second.